Dibs is an entrenched practice during Chicago winters, but did it originate here? 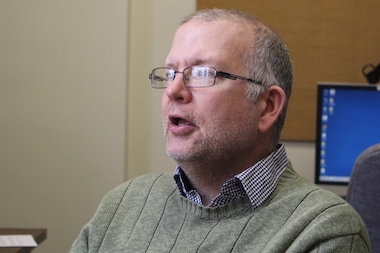 Editor's note: This story was originally published Feb. 2, 2015. OLD TOWN — Just when did "dibs" begin? The question might not be as old as time, but it's definitely in the not-too-distant past. After all, there was no need to lay claim to shoveled-out parking spaces in the horse-and-buggy days, when horses and buggies were typically kept in backyard stables that have since been converted to garages, or of course, coach houses. No, dibs has to originate from the days when big cars took up big spaces on city streets, and shoveling them out from under a ton of snow gave one the right to lay claim to the cleared land — at least for a little while. Nelson Algren's 1951 poem "Chicago: City on the Make" is devoted to tales of local venality and mendacity, yet makes no reference to the practice of dibs, by that or any other name. If it were in force back then, Algren would have written about it. According to Peter Alter, a resident historian at the Chicago History Museum, that original confluence of snow meeting labor with self-righteousness as a catalyst comes, appropriately enough, from the Big Snow of 1967. That storm, in which a record 23 inches of snow fell, appears to be when Chicagoans finally felt they had the right to the parking spaces they cleared. It makes sense, in that that snow was notable not just for being deep. It was heavy, too, and it fell after the city had seen record January highs in the 60s only two days before. Alter cited a Feb. 9, 1967, Tribune editorial with the headline "Post-Blizzard Etiquet [sic]." "The way the references were written, this was a new thing," he said. "Does an automobile owner have any special rights to a parking spot which he has spent hours shoveling out?" the Tribune states. "Motorists in a good many parts of the city obviously think they do, because they are staking out their domains with folding chairs, carpenters' horses, and anything else that may come to hand." It goes on to state that others are of the opposite opinion and feel free to poach the cleared spaces, but adds, "Our emotions and our sense of decency tempt us to sympathize with the shoveler, but if it ever came to trial, the squatter would probably win out. We mention the problem only in the hope that the city will finish clearing all the streets before somebody gets murdered." Twas ever thus, it seems, at least since 1967. The Reader's "Straight Dope" columnist Cecil Adams likewise traces dibs to the 1967 snow, although he insists it didn't become "an entrenched phenomenon" until the 1979 winter that produced a record 89.7 inches of snow overall. Today, Chicagoans are still arguing over dibs. Our own Mark Konkol says if you crack a sweat shoveling out a car, it gives you a right to call dibs — for a time. Others have seized the chairs from the street and put them up for sale on Craigslist. The Chicago History Museum's Peter Alter said "dibs" dates to the "Big Snow" of 1967. But is that the origin of the practice nationwide? 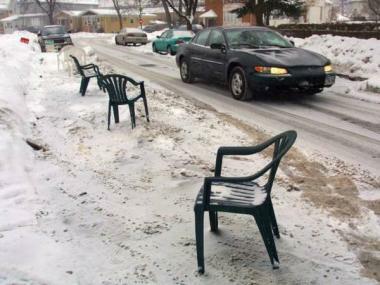 There's a Tumblr site devoted to "Chicago Dibs," as well as a Facebook page, but then there are others out to declare a "Chair-Free Chicago." But is Chicago unique in this practice? As it turns out, no, we are not. In fact, we may not have even been the first to employ the practice. The Pittsburgh Post-Gazette claims photographic evidence going back to the '50s for the "Pittsburgh parking chair." An article last winter declares that "it's been a folk tradition for as long as anyone can remember." Suggesting the practice could go all the way back to the Ford Model T, Ronald Yochum Jr., chief information officer for the Pittsburgh History & Landmarks Foundation, said, "Geography, weather and the lack of parking availability on narrow roads of older cities like Pittsburgh and their first-ring suburbs helped create the conditions" to foster the Pittsburgh parking chair. "There is a sense of 'fair play' and respect in Pittsburgh when someone spends an hour or so shoveling off a space," Yochum added. "I've shoveled spaces in front of my mother's house and shared it with a neighbor. Everyone understood that the space was 'ours' until the snowplows came and cleared the street. "In some neighborhoods, such as Pittsburgh's historic South Side, moving a chair will often be met with disapproving stares of the neighborhood grandmother, or a reprisal of a nasty note on your windshield, or something worse. I never violate the sanctity of the chair," Yochum said. In Pittsburgh, they take dibs seriously. One driver who moved a chair aside to park in a cleared space returned to find the car encased in ice from a garden hose. The chairs are apparently banned in Washington, D.C., but in Boston they're approved until 48 hours after a declared snow emergency has ended. Commonwealth Press in Pittsburgh sells "official" folding chairs stamped "NO PARKING" and "DO NOT MOVE" for $35, but only in the store, not online. It does sell a $15 T-shirt by Web order.